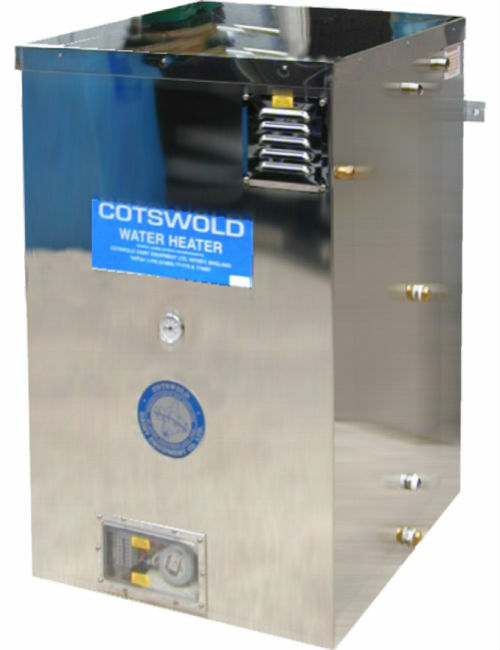 The Cotswold Coil Udderwasher / Combi-heater is a 10 gallon/45 litre water heater, incorporating a 3Kw element and a 15mm copper coil. 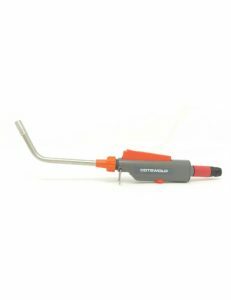 The udderwash system is supplied through the coil, whilst warm water can be drawn from the main tank for calf feeding etc. 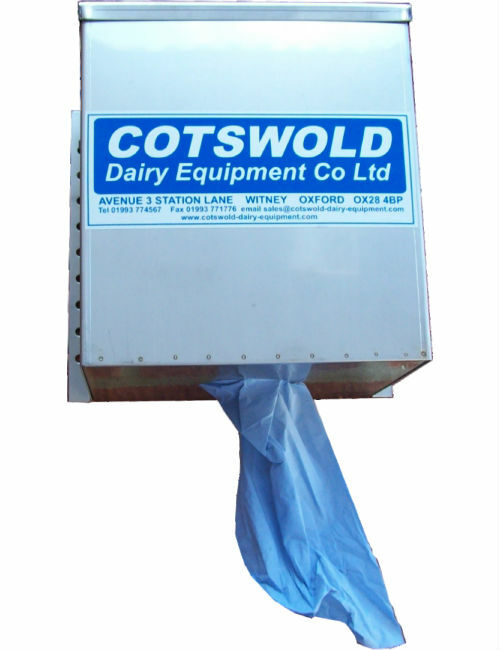 The unit can be used in conjunction with a Dosatron entrainment unit on the udder wash delivery if required. A ready supply of fresh clean warm water at mains pressure. Floor-standing or wall-mounted stainless steel cabinet with stainless-steel fully-insulated inner vessel. 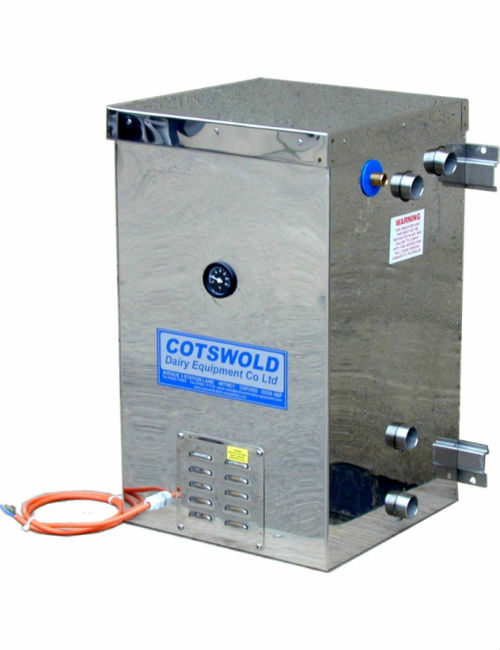 Gives a ready supply of fresh, clean mains water at mains pressure to wash cows. (We can supply a pressure reducing valve if needed). Can be fitted at any height, as water in coil at mains pressure. 10 gallon/45 litre capacity heater. Cooper heat-exchanger coil runs through the hot water in the heater. 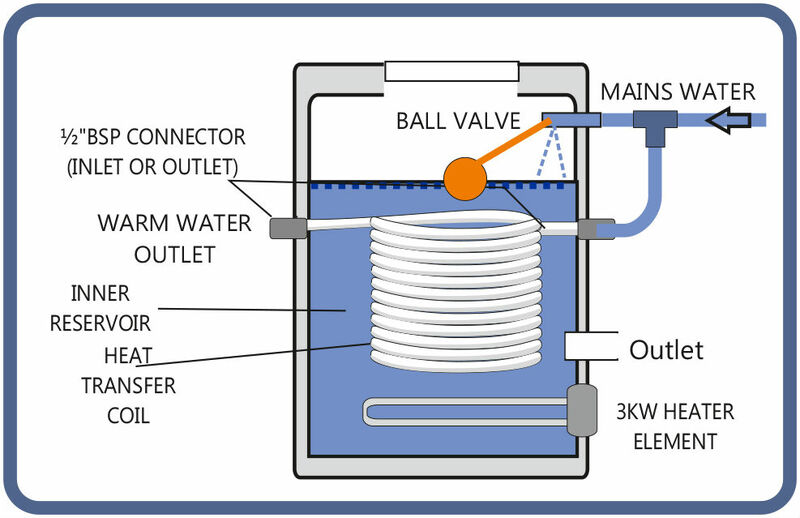 Fresh warm water supplied at mains pressure via the coil (good water pressure required). Suitable for udder washing in small and large parlours. 3Kw thermostatically controlled element for quick heating. Independant supply of warm water available for calf feeding etc. Will run off a 13 amp electricity supply. Note: This unit can also be supplied as a straight forward 10 gallon/45 litre gravity water heater, without the copper coil fitted.